Instantly feel better! Your soulmate for the darkest days. What the heck is a boost box? This is something my clients ask me when I say they need to build one, so I’m guessing you might be thinking that too. So if you haven’t heard of this free therapy, read on. Clinical Hypnotherapy is not just about being hypnotised. The whole process of this type of brief therapy is to provide you with the tools to be able to help yourself, and not need to be in therapy for years. Combining cognitive behavioural therapy and hypnosis is the best of both worlds, and you learn some of the best techniques for getting results. You might be thinking who is the best hypnotherapist in Andover? Will hypnotherapy work for me? Maybe you’re wondering what happens in a hypnotherapy session? The hypnosis is just part of that process. 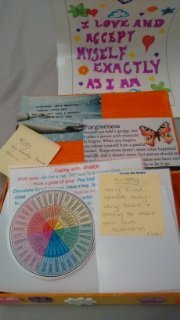 The Boost Box is a homework task that I use with some of my clients. It’s a task with the purpose to help you to begin noticing the good things around you, changing your perceptions and beliefs. This isn’t for everyone, in every situation, but if you are in the right place in your journey to recovery, the Boost Box is a wonderful piece of ammunition to have at hand when you need it. It is a box, but it does not have to be. It can be any sort of container in fact. Just something you can get to easily. I use a little box, but some people use jars. Use whatever you have. The aim of this box is to keep it readily accessible, and to start filling it up with things that make you happy, or feel good. When you are in a dark place it can be hard to think that there is anything that makes you feel good, or makes you happy, but if you really take a step back to notice then I am certain you will find it. You just need to look. This doesn’t have to only be a tool for those suffering the effects of trauma or depression; it’s a good thing to have tucked away in your arsenal if you have crappy days and takes things to heart. If something small starts you off feeling bad in the morning, (we’ve all been there) by the end of the day the whole 24 hours feels like a BAD day. If you are crafty, you might like to decorate your box. Make it bright, make it beautiful. Paint it, colour it, stick on it, use glitter. It doesn’t matter. This is your box and you should do whatever feels right, something that will feel good to open. Then you start filling it up. But fill it with what?? You know the days when you go to the shop to just pop in for milk and you haven’t done your makeup or brushed your hair to within an inch of its life. Your feeling pants but you bump into someone you haven’t seen for a while… you stop and chat, they say you’re looking well (even if you don’t feel it! )well… Put that into your box! I have a thing about stationary, I rather like multi coloured post its. Write on your post it “ I saw Alison today, she said I’m Looking well” I don’t give a monkeys that you don’t think you look well. Alison does, Alison paid you a compliment. Accept it and say thank you. If you dismiss a compliment and brush off Alison, it’s just like she gave you a bunch of flowers and you cut the heads off. You wouldn’t do that would you? Maybe you have a favourite quote, or meme from Facebook. Print it out; put it in your box. One of the quotes in my box is “Life isn’t about waiting for the storm to pass, its learning to dance in the rain”. Use something that means something or resonates well with you. Have you got a cd you love to listen to, that cheers you up, or maybe makes you feel at peace. I adore the piano, and think it is one of the finest instruments ever made. Yiruma is one of my favourite pianists and this piece makes me feel like nothing else. You can hear River Flows in You here courtesy of youtube. I can listen to this on repeat for hours and never be tired of it. Use what you connect with. If it’s Sean Mendes, pop him in the box! Do you have a story of someone who inspired you? Someone who made it through their tough time, use that inspiration to help you know you will get through too. Even from your own experience from another time where you got through something tricky. There is an endless list of things to add to your Boost Box, the thing to remember is, that anytime you achieve something, no matter how small; Put the laundry out, completed your household chores etc. Anytime you receive a compliment, anytime you do something you can be proud of, put it in the box. Depending where you are in your journey of recovery, that might be as simple as getting out of bed before midday, then put it in the box. Nothing is too small to recognise your achievement. This is a great way to feel better when depressed. Credit yourself on the small things, the big will follow. They absolutely will, if you give yourself the opportunity. When you are having a truly rough day. Maybe Post traumatic stress has hindered you all night long and you feel out of it. Get your Boost Box out. Feel those pieces of paper in your fingers. Read what you have written. Look at the pieces you chose to put in there on your good days. Listen to the music. Look at the pictures. Just place all of your attention on the contents in that box, allow this to help ground yourself and notice how your mood & emotions begin to change. If your box becomes full & you can’t put another thing in it, you are doing great, but don’t stop. Get another box. Maybe remove some of the smaller things you have overcome and develop the box as you develop. Allow it to change with you as you progress on your journey. This is my Boost box. I have used this for the last 3 years. I was fortunate enough for some lovely ladies to write some post-its for me about the qualities they found most inspiring about me. There are many ways that hypnotherapy can help you overcome trauma. If you would like more information on how hypnotherapy for Post Traumatic Stress can help, get in touch. Or maybe join the mailing list for more tips and tricks to help you, and don’t forget, let me know how the Boost Box helps you.